Are you suffering from missing or badly decayed teeth? Tooth loss can occur when a tooth falls out on its own accord. Other times, your dentist might recommend a tooth extraction of badly decayed teeth, as the best way to preserve the health of the surrounding teeth and gums. Whether you are missing one or multiple teeth, dental implants can restore the function and appearance of your smile. Dental implants are a revolutionary restorative and cosmetic treatment that replace missing teeth with a color-matched prosthesis that looks and acts just like a natural tooth. The main difference between dental implants and other restorations is that dental implants are a permanent solution to missing teeth and are secured to the jaw bone, giving them their renowned strength and durability. Permanence. Implants are permanently attached to your jaw bone, giving you the freedom to eat anything you desire without the fear of them coming loose or slipping. Strength. As the only tooth loss prosthesis that is fused to the jawbone, the titanium posts that forms the base of the implant is extremely strong and durable. Successful. The titanium that is used to make the implanted section of the prosthesis is biocompatible. This means that it is virtually never rejected by the body, contributing to the 98% success rate of dental implants. Discreet. No slips and color-matched porcelain make dental implants extremely discreet and natural looking. Easy to clean. With dental implants, you can brush and floss your teeth as normal, helping you to maintain a great oral care routine. If you have multiple teeth that are badly damaged or decayed on either the top or bottom arch, then you might consider a full arch replacement. As its name suggests, this treatment involves replacing all of the teeth in the mouth’s arch with prosthetics. These are attached to a bridge, which is then secured to your mouth using dental implants. One of the key benefits of a full arch replacement is that there is no need to have one implant post per prosthetic tooth. Instead the entire arch is supported on just four or five titanium posts that are firmly fused to your jawbone. The exact number of implant posts will be decided at your consultation appointment. Teeth Xpress is the ideal solution for replacing multiple missing teeth. It works by securing your existing denture to dental implant posts, meaning that you don’t get any of the embarrassing slips and movement that is commonly reported by wearers of conventional dentures. 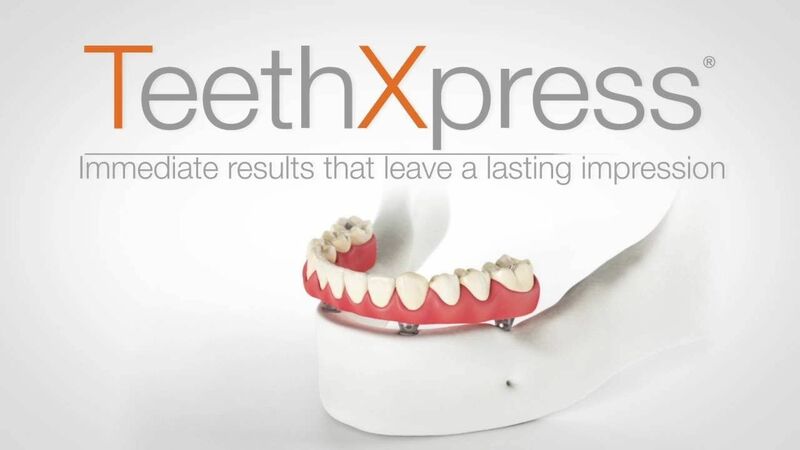 Teeth Xpress also minimizes the natural bone erosion that occurs in patients who wear traditional dentures. Jawbone erosion from traditional dentures can make you appear rapidly aged, due to the fact that your jaw will appear more narrowed. Choosing Teeth Xpress can help preserve the strength of your jaw bone, and reduce the likelihood that you will need bone grafting for future implant-based restorations. The Teeth Xpress procedure is relatively quick, completely painless and usually successful. You will even be able to return to work the next day. If you have just a single tooth that is missing or requiring extraction, then you are most likely a candidate for a single tooth implant. 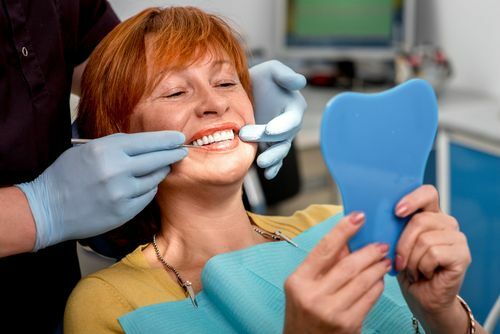 This procedure involves placing one implant post into the jaw bone at the required location, and attaching a color-matched porcelain crown to it using a special connector known as an abutment. Once in place, the custom-designed implant looks completely natural, restoring the appearance and function of your teeth. Our surgeons have expert training, skill, and experience for delivering first class dental implant procedures and patient care at our offices in Fayetteville, Oneida and North Syracuse, NY. Don’t suffer with the embarrassment of missing teeth any longer. Make an appointment with our professional, reassuring team today.